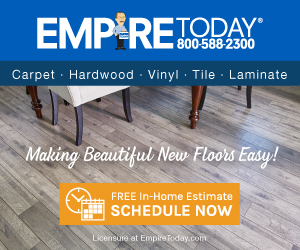 I purchased carpet from Empire on Nov 14, 2008. I did not receive any of my remnants, but the carpet looked nice. I received my credit card transaction on Dece 3, 2008. On Nov 15, 2008, my card was used to make a cash advancement for $726.99 from a "Xoon Corporation" located in CA. This corp specializes in money transactions. My card was used for "business purposes". Originally, I had not made any purchases on the for 2-3mos and after spending $1200 on carpet, I wanted nothing else on the card. Yes, I was taken advantage of. Empire has 3 places where credit card numbers, code and expiration dates are written in their files. When I spoke of the incident, The Empire representative denied that someone in their company could be so cruel and callous. It's Christmas time and some people will do anything for money. I also called Empire earlier Dece 3 to report a snag. They told me someone would call me in 3-5 to schedule an appointment. When I called about my credit card incident and complained about the snag, the appointment was made immediately and they repaired the snag on Dece 5th. Be aware of Empire. I won't recommend them to my worst enemy. Review #135199 is a subjective opinion of User135199. I used tp work for Empire and they are careless with credit card numbers. They make the sales person write your credit card number on the Purchase Order and it goes through all the copies. They have a very high turnover on sales people so when the employee quits or get paid on that order they throw the order away. Anyone can get that information.